The Holiday Season has started, and what good little drummer boy or girl doesn’t deserve a NEW Cymbal this year! If you’re heading out to your favorite music store to catch all those great before & after Christmas sales, then we have some cymbal shopping tips from the man who knows more about cymbals than anyone on the planet -- Zildjian’s Director of R&D, Paul Francis. In his 28-year career, Paul has listened to thousands of cymbals, honed his craft at the knees of Armand Zildjian and Leon Chiappini, and has helped hundreds of Artists find their sound. And now he’s offering his expertise & knowledge to help you find yours. To be sure you’re happy with your next Cymbal purchase, we took Paul to the local drum store to get his advice on the best way to shop for your next Zildjian. One of the most important tips for buying cymbals is to know what you want before you go the the store. Is it a Ride cymbal or a Crash? Is it dark? Bright? Do your homework first. 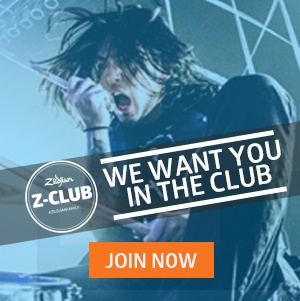 Visit websites like Zildjian.com or YouTube.com to watch videos and try to narrow down your choices. Then check with your local Zildjian dealer to see that they have the cymbal(s) in stock that you want to try/play. Establish a good relationship with an expert at the shop and talk to them about the sounds you’re interested in hearing. Remember also to choose a cymbal for the style of music you are playing. Having the right “tool” for the job, so to speak, will make a big difference and ensure your cymbal will last. Are you a drummer that requires a versatile cymbal, one that covers a wide range of musical styles? Or are you a more specialized drummer looking for sounds to compliment a particular genre? Having an understanding of a cymbal's role in your music is important. Again, ask a store specialist or talk to Zildjian Customer Service about lines and models that can best suit your needs (800-229-8672 inside the USA, or email zcustomercare@zildjian.com). Pack your cymbal bag and take your set-up to the store with you. The one thing you don’t want to do is pick a cymbal that sounds too similar to the ones you’re already playing. Drummers have a natural tendency to select a set-up where all the cymbals sound the same. Keep your ears open to new sounds and colors. If you are looking for a Crash cymbal and you already have a really high pitched one, try going for a lower pitched/larger diameter Crash. If you are a drummer that typically favors a brighter sound such as A Zildjian, try a darker color like Zildjian K or K Custom. If you prefer smokier sounds like K Constantinople or Kerope, try a cleaner, more defined sound like A Zildjian or Avedis models. By sampling different or contrasting sounds, you can enhance the dynamic range and depth of your setup. This will give you more sound options/emotions when playing. Think of your set-up like a painting where you want different colors. Bringing the cymbals you’re already using with you will ensure the new model will fit in and enhance your overall set-up. 3. Test with a heavier stick …and bring the drumsticks you always use. When testing cymbals, use a stick that has some weight behind it, like a 5A or a 5B. A heavier stick will help get the metal to vibrate to its maximum potential so you can hear what the cymbal is going to do and what it’s not going to do for you. Once you’ve narrowed your selection down, you will want to use your preferred drumstick model to play it, especially on a kit. This will allow you to play and hear the cymbal in a similar way to those already in your set-up. If a drummer friend is willing to join you, bring him or her along and have them play all the cymbals you’re considering so you can step away and hear it from the audience point of view. Be sure to listen to the potential choices in relation to the cymbals that you’ve brought with you. If a friend is not available, ask a store employee to give you a hand. It’s important that you listen from both in front of and behind the cymbals to get a clear idea of a cymbal’s tone, projection, etc. The subtleties make all the difference in creating your sound. A cymbal will sound different played on a cymbal tree or on an in-store slat-wall display, in a cymbal room, or a kit in the middle of the floor. After finding a cymbal you are interested in trying, ask if you can take it off the wall or display and try it on a cymbal stand similar to the ones on your own kit. If available, the store may even let you take the cymbal into a practice/teaching room with your existing cymbals to hear them on a drumset. Play them at the volume you would normally play at; just be respectful -- keep in mind that you are testing cymbals for potential purchase, not auditioning for a gig! Sometimes you just need a little something “different”. If you already have a good amount of Crash cymbals, try adding a Splash or a China/Special FX to break up the tonal colors of your cymbal set-up. A China or EFX will add some explosive trash and white noise where a Splash will give you a quick/bright punch of sound and get out of the way. Stackers are really popular as well, where you can get a hand clap or cutting, gated cymbal sound. For ideas on stack combinations, check out our “Stacktober Gallery” here! As a final note, always trust your ears! With so many excellent Zildjian offerings to choose from, sometimes it can leave drummers feeling unsure about which model(s) to pick. When selecting a new instrument, you can simplify your choice by coming back to a basic idea: "It just sounds good!" Let your ears be your guide and have fun! We hope these tips will come in handy the next time you head out shopping for cymbals. If you like what you just read, be sure to share it on your socials, and subscribe to From The Stand for more from Zildjian! A special thanks to Peter Volpe and Greg Settino at South Shore Music for the use of their shop and their talent!